We looked for the Arctic Loon reported earlier this month, but the loons were well offshore and towards the sun, so plumage patterns were difficult to see. Chinstraps were visible on the Pacific Loon-looking birds. Oh well. The early morning rain had ended before we arrived, the sky cleared as the morning progressed, and everything was wet. Someone had placed boards across the numerous puddles on the beach path, for which we were grateful. The project permit is extended to mid-March, so – we hope – we’ll finally be able to use the new paths on our 3/24 walk, rather than be channeled like rats in a maze down the current narrow strait. It will be a relief to see the channel clearly rather than peering at it over the fence. Despite such obstacles, we’ve tried to get a relatively accurate handle on the birds in the channel during the project period. The channel is now permanently open to the lagoon and the birds paddle in and out at will, so the population fluctuates constantly. Here’s what we found before 9am today. Most of the ducks were in one large flock on the channel’s north shore, still snoozing. Ducks: Gadwall 20, Mallard 40, No. Shoveler, 20, No. Pintail 4, Green-winged Teal 20, Bufflehead 6, Ruddy Duck 20. Others: Great Blue Heron 1, Snowy Egret 2, Coot 65, Black-bellied Plover 6, Killdeer 2, Black Phoebe 1, Allen’s Hummingbird 1, Yellow-rumped Warbler 3, Song Sparrow 3, House Finch 2. Progress continues on permanent installations such as paths and viewing platforms. The gull flock has subsided significantly from the horde which covered the beach in December, dropping from about 2600 birds to about 660. Northern Pintails finally appeared, with two pair crusing around the lagoon and channel. 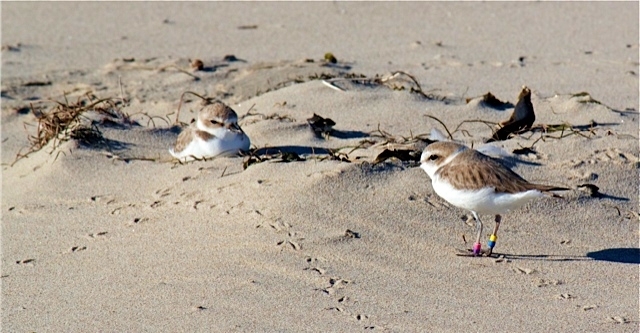 Other new arrivals are: an Osprey (last seen in August), 3 American Avocets still in winter plumage, and 2 Mew Gulls. Snowy Plover PV:YB wasn’t seen among the flock of 61 roosting on the beach, waiting for the tide to begin dropping, but GG:AR and NO:WW were there. 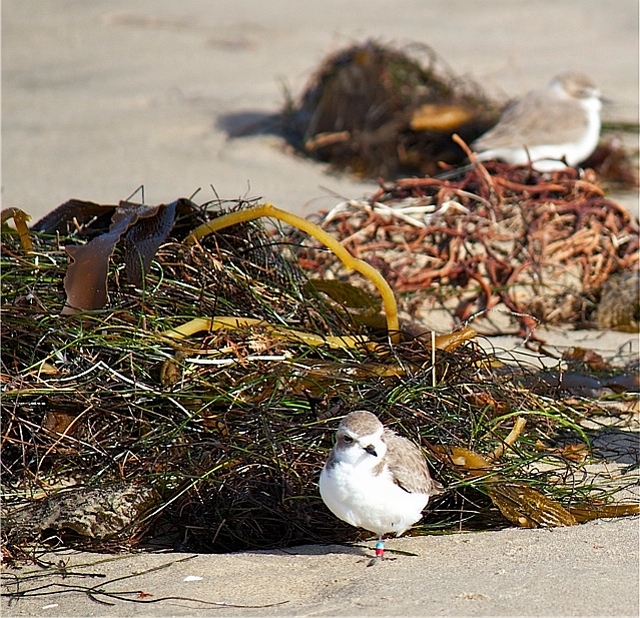 GG:AR (Left: green over green, Right: Aqua over Red) first appeared on Surfrider on 9/25/11 and was seen 11/25/12. NO:WW (Left: tan over orange, Right: white over white) appeared on 10/25/09 and recorded intermittently through 12/25/11. 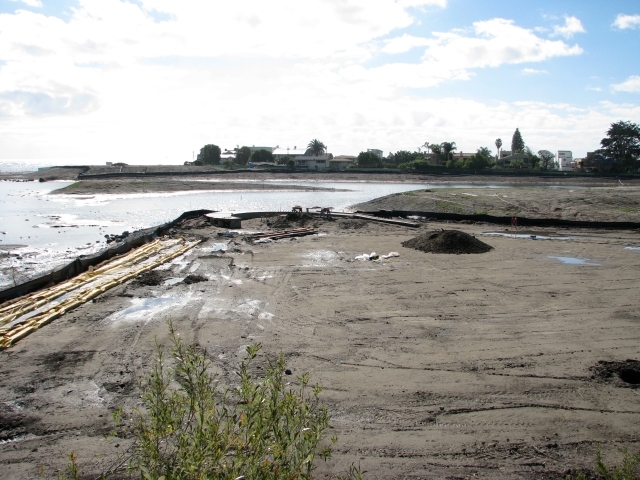 Our next three field trips: Ballona Creek Jetty, 9 Feb; 8:00am; Malibu Lagoon, 24 Feb, 8:30am; Hiker Lu’s Santa Monica Mountains Explorama, 9 Mar, 8am. Our next program: Tuesday, 5 Feb., 7:30 pm. Bird Photography, presented by Ralph Clevenger. Note that the meeting place has changed. The usual reminders will be emailed from the blog. Total Birds: January total birds of 1,818 are 20% below average for the same reason Dec. 2012 birds were 30% above average: large fluctuations in the number of gulls. Monthly numbers relative to average continue to be up, down, up, down, etc. Species Diversity: January 2013 with 65 species was a whopping 2% above the 63.7 6-year average. Summary of species diversity from the 6-year average so far: June -10%, July +10%, Aug. -6%, Sep. -20%, Oct. +5%, Nov +2%, Dec -4%, Jan +2%. Still, the only constant is change. 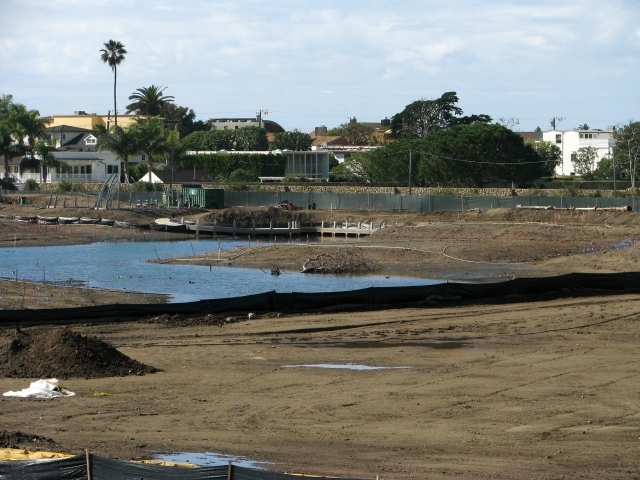 10-year comparison summaries are available on our Lagoon Project Page. Tide Lo/Hi Height L +1.7 H +5.9 L +0.65 H +4.94 H +6.49 H +5.76 Ave. Totals by Type 27-Jan 25-Jan 24-Jan 23-Jan 22-Jan 27-Jan Ave.
Total Species 27-Jan 25-Jan 24-Jan 23-Jan 22-Jan 27-Jan Ave.